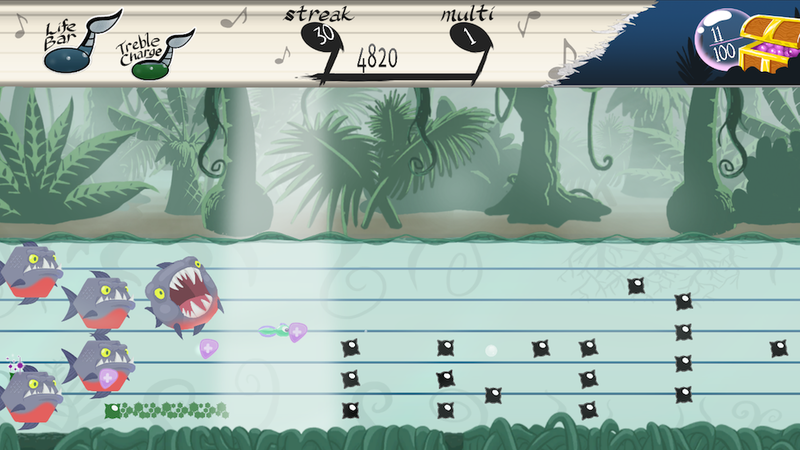 Tadpole Treble is the epic tale of a tadpole lost, alone, and far from home. This tiny amphibian must find her way back, dodging such dangers as piranhas, snapping turtles, and… musical notes. This quirky game is the work of Matthew Taranto, a man whose wise words I literally have framed and displayed on my desk. He created the Nintendo-themed webcomic Brawl in the Family, which ran for about six years. (I mourned its end on this very blog.) Upon concluding the webcomic, Taranto began working full-time on Tadpole Treble. Each stage of the game is basically a long musical staff, along which players must dodge the notes of the stage’s musical score. It’s a neat intersection of music and gameplay: two elements of game design that are too often disconnected. The game will be released for Steam (a digital marketplace for video games) in just a couple of days. I’m holding out for the Wii U release later this spring. It was apparently a childhood dream of Taranto’s to make a game for a Nintendo system, and I’m glad he’s finally done it. In other news, one of the game’s songs, “Thunder Creek,” has been stuck in my head for two weeks. I don’t usually support indie projects, but when Tadpole Treble showed up on Kickstarter a year or two ago, I tossed a few dollars its way as a small thank-you to Matthew Taranto. Brawl in the Family helped me through one or two really dark days, and he seems like an incredibly nice dude. If I were a rich man (yubby dibby dibby dibby dibby dibby dibby dum), I would consider donating toward more projects on Kickstarter, and also supporting creative people on Patreon. However, I’m definitely not a rich man, so I’ll have to settle for cheering them on. This entry was posted in Geeky Wednesdays and tagged Brawl in the Family, creativity, music, Nintendo, webcomic by Adam Stück. Bookmark the permalink. You’re quite right. I occasionally pray for creative people whom I admire, but not nearly as often as I should. JK Riki alerted me to this nice write-up on Tadpole Treble. Thanks for that! Following a few other links, it’s great to see you’ve been a big fan of Brawl in the Family as well, and to see that one of the things I’ve written is mentioned alongside quotes from C.S. Lewis, Mother Theresa, and Jesus Himself (!!!) is probably the most significant praise I’ve ever gotten for the comic. I’m glad that BitF was able to bring you through some tough times, and thanks for the mentions over the years! Your work has brought me a lot of laughter and happiness over the years. (Besides Brawl in the Family, I still catch myself singing “I’ll Be There” and “The Samurai Always Wins” from Turnabout Musical at odd moments.) I’m delighted to see the return of the BitF podcast, and I look forward to Tadpole Treble whenever it hits the Wii U!